There’s something bracingly hostile about playing a game that was primarily designed to run on computers, like the just-released The Bard’s Tale IV. Free of the rigorous certification procedures that greet a new Sony or Nintendo release, these more independent efforts are allowed to exist in a rougher, sometimes even outright uglier state at birth, one that challenges players to dig through their detritus in order to get to the treasure underneath. 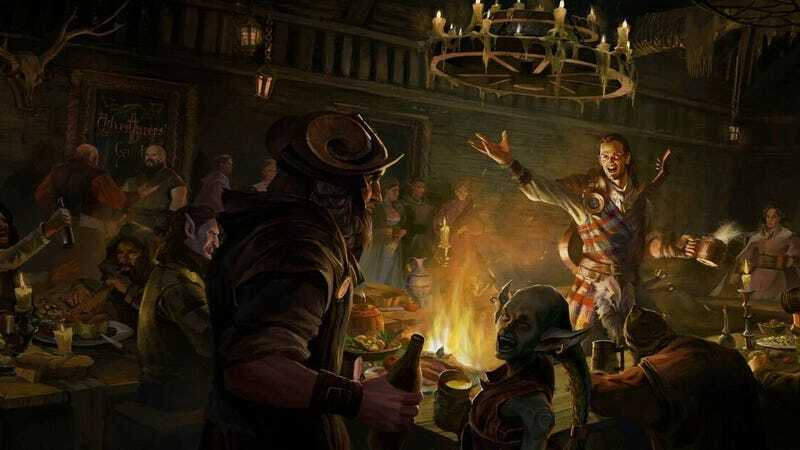 To beat that hoariest of dead video game horses, Bard’s Tale IV—which hopes to invoke the legacy of the classic RPG series, and not the comedic action-adventure title from 2004—is a bit like Dark Souls, except the first huge difficulty spike happens not at the hands of some glowering minotaur, but during the graphics options page, as you battle to get the damn thing to run at all. Maybe it’s just Stockholm syndrome, though, but there’s something strangely satisfying about cranking down the draw distance and screwing around with your ambient occlusion settings, squinting your way through borderline criminal frame-rate drops and load times, and sifting for whatever gold is there. Coming off a slickly packaged, player-friendly big-budget title like, say, Marvel’s Spider-Man, it’s an almost bewildering sense of whiplash—but the kind that can give you a cheap, thrilling head rush while it happens. Get good enough to fight your way past the initial growing pains and there’s a lot of little pleasures hidden away here, too, mostly in the way the game handles its fights. InXile Entertainment has found a suitably elegant way to handle the weird abstractions of big party combat, creating a fighting system that places a lot of emphasis on where characters are standing, and managing the cooldowns on their various abilities. (Fighters hit and guard, rogues stab from the shadows, and the iconic bards sing and drink.) If you cut your teeth on the original games—or even just Baldur’s Gate, the more natural evolution of this style of PC fantasy fighting—it’s going to come off as lacking in complexity, but on its own merits, there’s considerable fun to be had. BTIV also does a decent job of replicating the feel of a traditional dungeon crawl, especially once you get into the dungeons proper, which are typically jammed full of puzzles, riddles, and interesting fights. At its worst, Bard’s Tale IV can feel like cosplay of the style of game it’s meant to be invoking. (Well, actually, at its worst, it’s barely functional as a piece of software—this is definitely a situation where waiting for the promised week one fix patch is probably a good idea.) Non-player characters, while well-written, lack depth, parroting back the same few lines no matter how many times you visit them. Exploration tools are little more than esoteric keys to a variety of easily identified doors. And the vast underground labyrinth of Skara Brae frequently feels like little more than a series of gussied-up corridors. But when it clicks, it clicks hard, invoking those old, long-forgotten feelings of being lost in a hostile place with nothing but your wits and your weapons to help you win the day. That’s the sort of thing that can occasionally be worth sifting through a little dross to find.